Mark Nathanson grew up as one of two children of Jack and Mae Nathanson, who operated a wholesale grocery company in Sydney, Nova Scotia. After attending St. Francis Xavier University in Antigonish, he founded a number of businesses that became highly successful internationally. In particular, in the 1980’s he founded a gold mining company, known as IAMGOLD, that discovered a gold deposit estimated to contain over eight million ounces in Mali. Along with former RCMP Assistant Commissioner Rod Stamler, he founded Forensic Investigation Associates. FIA owns leading forensic investigation companies operating throughout the world. Mr. Nathanson is also Chairman and CEO of Kronotype Watch, the sole importer and distributor of Kronotype watches in North America and the Caribbean. Having achieved success in business, over the past 15 years, Mr. Nathanson has become a major philanthropist. In 1997, he made a gift of $3 million to create a permanent endowment for the Jack and Mae Nathanson Centre for the Study of Organized Crime and Corruption (the predecessor to the present Jack and Mae Nathanson Centre on Transnational Human Rights, Crime and Security). His endowment represents the largest single gift ever made by an individual to Osgoode Hall Law School. In 2002, Mr. Nathanson provided a multi-million dollar endowment to create the Maria Nathanson Centre for Excellence in Digestive and Pulmonary Disorders, located at St. Thomas Hospital in Nashville, Tennessee. Founded in 1898 by the Daughters of Charity, St. Thomas Hospital is one of the top cardiac care centres in the U.S. The gift was the largest such donation the hospital had received at that time. The Maria Nathanson Centre, named after Mr. Nathanson’s late wife (who had been a patient at St. Thomas) combines state-of-the-art medical care with research and education in the field of digestive and pulmonary illness. Consistent with his dedication to combating crime and corruption, in 1999 Mr. Nathanson founded the Nathanson Foundation, which raises funds to support and assist law enforcement initiatives around the world. The Foundation raises awareness of law enforcement issues and needs. It also helps to build relationships between law enforcement, the public, and the international business community. The Foundation identifies and financially supports projects that will assist law enforcement to curb the activities of organized crime, and to develop and support law enforcement training programs. Mr. Nathanson supports numerous other charitable and public interest activities. He is a Trustee and significant benefactor of the New York City Police Museum; a Director of the U.S. Federal Law Enforcement Foundation; Director of the U.S. Federal Drug Agents Foundation; and a Director of New York’s Finest Foundation. He is one of six Charter Members of the Canadian Chapter of Transparency International (located at York University, out of the Schulich School of Business), the main international non-governmental organization dedicated to combating corruption. In recognition of his public service, particularly in the field of law enforcement and combating organized crime and corruption, Mr. Nathanson has received a number of significant honours. New York’s Finest Foundation honoured him as “Man of the Year” in 1999. He also was made Honorary Commissioner of the New York Police Department, which is the highest honour that organization bestows on a member of the public. As well, he has received the U.S. Federal Drug Agents Foundation award for outstanding service to law enforcement internationally and was named the Honorary Chief of Police of the Metropolitan Nashville Davidson County (Tennessee) Police Department. In 1995 he received the Chevalier of Merit, Order of the Lion, from the President of Senegal for outstanding service for the benefit of the Senegalese people. He has also received the Saint Thomas Seton Honor, awarded by the Seton Society of the Saint Thomas Health Services of Nashville, Tennessee, in recognition of his commitment to the community and excellence in his personal and professional endeavours. 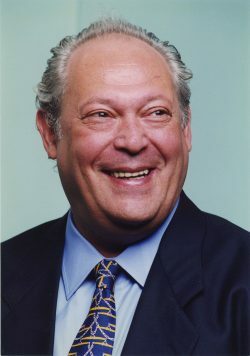 In 2006, Mark Nathanson was honoured with the degree of Doctor of Laws (Honoris Causa) at the 2006 Spring Convocation of Osgoode Hall Law School.